This week we blogged on The Neil Young Archives (NYA) status and ran a poll on predicting the release date. -- Over 80% of respondents believe that NYA will miss the Feb 24, 2009 release date. -- An astonishing 18% believe that NYA will "Never" be released -- almost equal to those voting for NYA meeting the target release date. 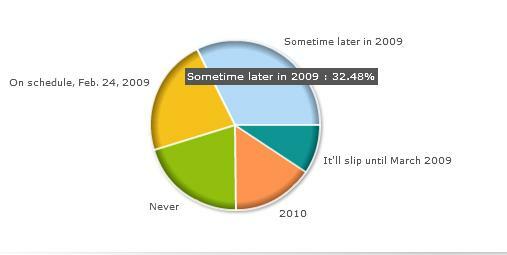 -- "Sometime later in 2009" topped poll with 32%. So when do you think The Neil Young Archives will be released? *BREAKING! - New Song: "FORK IN THE ROAD"